Next Meeting: Wednesday, March 12, 2014, 6:30 p.m. – 8:30 p.m. The Dremel is an amazing handheld rotary tool that can cut, grind, drill, etch, carve, polish, buff and trim materials ranging from bookboard, wood and linoleum to glass, ceramic tile, and metal. Inspired by Jill Timm and her Amazing Dremel workshop, Jill Abilock and Elissa Campbell will share what makes the Dremel such a valuable tool in their studios. The first part of the presentation will include Dremel basics and how-tos, as well as live demonstrations on a variety of materials. Elissa and Jill will also bring the sample books of materials they worked with in Jill Timm’s workshop, which, in addition to the above, include glass, mirrors, Plexiglas, and polymer clay. In the later portion of the meeting, you will have an opportunity to try out a Dremel and experience for yourself what a handy tool it is! Dremel tool: Jill and Elissa each have only one Dremel. In order to enable the greatest number of people to get a hands-on feel for the tool, they have requested that anyone who has a Dremel and is willing to allow others to try it out please bring it to the meeting. Safety gear: There will be protective eyewear and face masks at the demo table. Anyone wishing to try out a Dremel will be required to wear both. Please note that regular eyeglasses alone are not considered sufficiently protective (there will be safety glasses available that fit over regular eyeglasses). In addition, there may not be enough face masks for everyone to have their own. If, for hygienic purposes, you prefer not to share, you may wish to bring your own face mask. One final note: Anyone who suffers from asthma or other respiratory issues might want to bring a good quality face mask to wear during the meeting as there will inevitably be a fair amount of dust in the air. In February, Jill Abilock gave us a taste of both the simplicity and extraordinary beauty of Japanese stab bindings. From the tiny book earrings to her larger sewn books, she showed inspiring examples of techniques including simple sewing, beading and wire work. Particularly interesting was Jill’s method and inspiration for developing her own sewing patterns, using on-line resources as well as source books of Indian dot patterns. The hands-on portion provided us with take-home models of traditional patterns, and ideas for book projects of our own. Thanks to all who participated, and particularly to Jill for sharing! *** Congratulations to Marianna Holzer who was featured in an article in Seven Days entitled Perfect Pages. Marianna owns Holzer Book Bindery in Hinesburg, where she creates bound books as well as repairs historical or sentimental books for private clients. *** Artist and teacher Jane Davies presented an inspiring workshop on Saturday, February 22 to a group of fantastic women artists. Jane guided us through the process of finding text, making text, combining text and images, and altering all of the above. The day went too fast, but all the participants came away with a new way to ‘read’ text, as well as some fine techniques to explore. Thanks, Jane, for a terrific day. *** The Book Arts Guild of Vermont is happy to announce that the Spring exhibit will be hosted by the Rae Harrell Gallery in Hinesburg, in May. The show’s theme will be Nature: Beasts and Botanicals. This broad theme can inspire fantastical, outlandish ideas as well as environmental, natural concepts. Find inspiration everywhere: on your daily walk, at your birdfeeder, on Pinterest, and at the library. Whether or not you have exhibited with us in the past, all members and friends are encouraged to submit work. The deadline for submission has been changed to April 21st. Click here to download the exhibit entry form. *** The New England Guild of Book Workers is looking for volunteers for an upcoming Girl Scout event on Saturday April 12th. The event will run from 1:00 p.m. – 5:00 p.m. at Camp Maude Eaton at 141 Abbott Street in Andover, MA, which is about 20 miles north of Boston. This program is for Cadette scouts (age 11-14) to earn a Book Artist badge. There will be an introduction and then five stations that the girls will rotate through which may include printing, accordion folds, a pamphlet, origami book, a scroll and decorating paper. Each rotation will last for about 30 minutes. If you have a book arts technique or project that you’d like to see done with the girl scouts please make some suggestions. You do not need to be a member of the NEGBW to volunteer. If you would like to volunteer, please contact Todd Pattison at bookandtile@att.net. *** The annual Book Arts Bazaar at the University of Southern Maine’s Wishcamper Center will take place on Sunday, April 6th. The Bazaar is a festival with book artists, papermakers, bookbinders, printmakers, educators, writers, and all things related to the book. The Bazaar is free and open to the public from 10:00 a.m. until 3:00 p.m. The Wishcamper Center is located on Bedford Street on USM’s Portland Campus. USM’s Kate Cheney Chappell ’83 Center for Book Arts is sponsoring the Book Arts Bazaar and profits from this event support the center. If you are interested in being a vendor at the Bazaar, there are still some tables available. The table rental cost is $45.00 and the deadline is March 15th. For registration information, contact Rebecca Goodale at goodale@maine.edu or (207) 228-8014 (207) 228-8014. *** The Mortimer Rare Book Room at Smith College in Northampton, MA will be hosting the first of a new book arts lecture series on Thursday, April 10. Mark Dimunation, Chief of the Rare Book & Special Collections Division at the Library of Congress, will present Single Voice, Many Hands: the Nature of Vision and Collaboration in Contemporary Book Arts. The lecture will be followed by a gala reception. The lecture will be held in the Browsing Room in Neilson Library at 4:30 p.m. For further information, please call (413) 585-2906 (413) 585-2906. *** On April 19 – 20, the North Bennet Street School is offering Natural Dyes and Decorative Paper Techniques with Tatiana Ginsberg in Boston. Working from the Japanese tradition of dyeing paper with natural dyes, students explore creative methods of coloring and patterning handmade papers. Experiment with dyes derived from natural materials such as cochineal, cloves, lotus and much more. The bright and subtle colors derived from plant materials are safe and pleasant to work with and harmonize well with natural fibers. 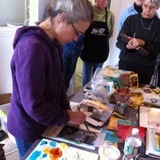 *** Jill Timm will be presenting her fabulous workshop The Amazing Dremel on May 10-11 at the Northeast Document Conservation Center in Andover, MA. The workshop will be hosted by the New England Guild of Book Workers. The registration fee is $250.00 with an additional material fee of $50.00, which includes your own deluxe Dremel kit with over 100 various attachments. In this workshop, Jill will demonstrate the limitless options of the Dremel tool. Each student will provide their own Dremel and learn about the various attachment options while using the tool to drill, cut, carve, etch, shape, polish and grind into non-traditional book materials. Students can expect to experiment on materials such as glass, plastic, metals, wood, tile and more. To register for the workshop, please contact Todd Pattison at bookandtile@att.net.